Sandra Granberg is UX designer at NetRelations. As users move from application to application to complete a specific task or many different tasks over time, they will meet the visual design, functionality, interactions and the overall tone of voice of the company or organization. Creating consistency across these disciplines, regardless of application, help users complete tasks faster and builds expectations for future interactions with the organisation. Design consistent user experience by shifting focus from designing web pages to designing atomic design systems. With Style guides and Atomic design, every single piece of the user interface is considered individually to work beautifully regardless the device, screen size or scenario. This approach enable organisations to reach their goals in their digital transformation projects. 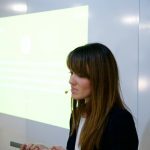 Sandra will talk about a modular design process that covers all phases and disciplines of designing the user experience, from the conceptual design and interaction design, through the graphical design to the technical front end development.